3:28 PM: so here’s where it’s at now. one could say i am enamoured with the clouds. that would be accurate. our skies here in crestone/baca are especially rich, and our air is so clear that the clouds gain a dimensionality and presence. but i still have a lot to learn about painting them. more tomorrow…good night my friends! 2:33 PM: this morning i started work on the canvas i stretched yesterday, which is 32x40.” it’s inspired by a photo i took on that time & date from our west facing upper story windows, overlooking the vast expanse of the san luis valley. but it’s more of a cloud-scape, which was my intention for the series, titles sky high. 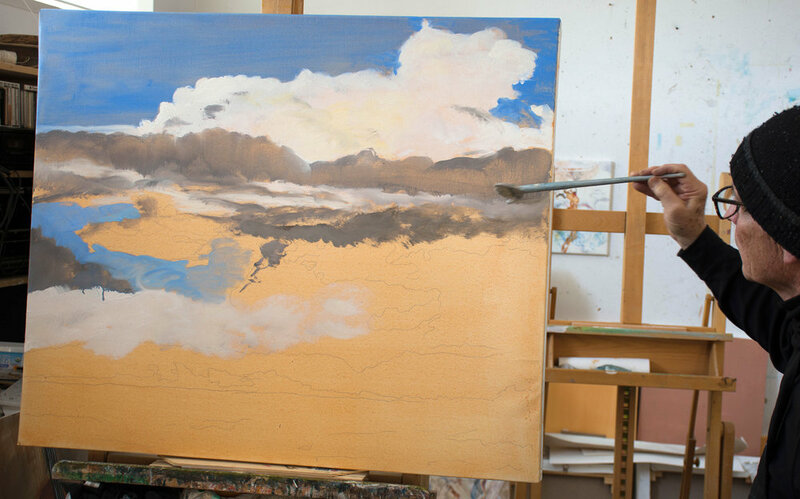 as i work on this 3rd painting in the series, i learn more about the subtleties of painting skies, which the great british master constable spent his entire life studying.like all painting, it’s really about mark making and distributing and balancing forms in space. back to work in this last hour of my energy resources for the day…i’ll post photos once i stop work.